Chicken elegant with steamed carrots and risotto. Chicken elegant (I believe it's pronounced "el-lay-gahnt") is a dish that sounds deceptively simple, but tastes so fantastic you wonder why it's not more popularly served elsewhere. 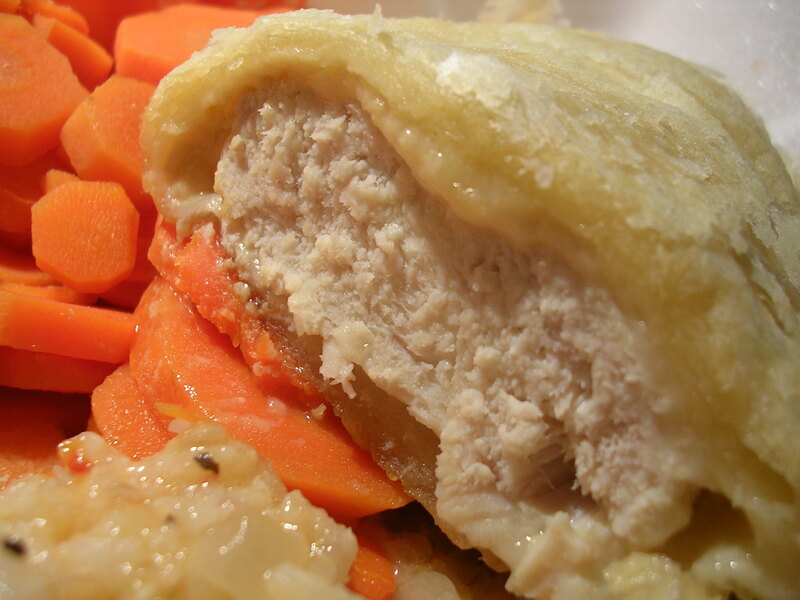 It is a chicken breast that is wrapped in puff pastry, with swiss cheese and Dijon mustard between the chicken and pastry, then baked to perfection. It's hard to convey the taste of it using just words, but the whole package just comes together really well. The puff pastry is crispy and buttery on top, and soggy on the bottom from the juices of the chicken. The chicken itself is not seasoned, but that is not a problem because the melted swiss cheese and the distinctive flavor of the Dijon mustard really come through and give each bite a burst of flavor. I wasn't expecting a whole lot from the risotto, which was kind of starchy, with very little liquid (I think the rice probably absorbed it all while it was sitting in the serving tray). But the flavor of the risotto was decent, not too bland but still subtle enough to complement the chicken elegant without distracting from it. 2. Pound chicken breasts to 1/2 inch thickness. 3. Spread mustard onto chicken, covering all sides. Top each breast with slice of Swiss cheese, roll up. 4. Roll each pastry sheet into a 12 inch square, and cut into 4 squares (6 inches each). Beat egg white with water, brush edges of each square with this mixture. 5. Place 1 chicken breast diagonally on each square, join the 4 points of the pastry square over the chicken and seal the seams. 6. Place on an ungreased baking sheet, and brush with remaining egg white mixture. Baker for 30 minutes or until chicken is done. Enjoy! This entry was posted on Sunday, May 20th, 2007 at 8:22 am	and posted in American, desserts, French, Italian, recipes, Uncategorized. You can follow any responses to this entry through the RSS 2.0 feed.